I gotta admit, Jon Favreau’s live action Jungle Book movie looks pretty badass. 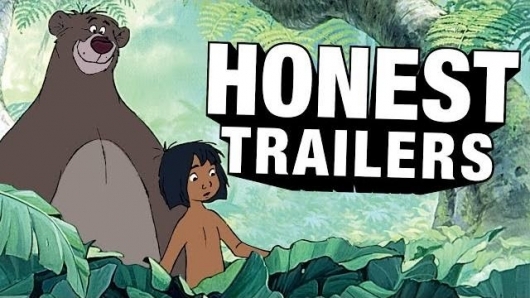 With the film opening this week, the gang at Screen Junkies built on a growing tradition of giving the Honest Trailer treatment to a beloved Disney classic animated film. With Lion King, Aladdin, and one of their biggest hits, Frozen done, it’s time to cue up “Bare Necessities” and take aim at 1967’s The Jungle Book. The Jungle Book was based on the story from Rudyard Kipling who inspired a generation… of white Europeans to imperialize the entire world, because it was their duty to christianize the savages. Yeah sorry, the history teacher in me just got out; but if you didn’t know Kipling wrote the poem, “The White Man’s Burden”. Go google it and read it… go ahead I’ll wait. You back? Sorry if the blatant racism of the author taints the Disney classic forever. Anyway, the entire animated film is basically a bunch of jungle animals acting like they’re in a “60s hipster bar” while passing around a loincloth clad little boy, who is subsequently trying not to get eaten by a tiger and eaten/molested by a giant snake. God! Re-watching Disney movies as an adult is awful sometimes! But the craziest part is when narrator Jon Bailey points out is split screen that the animators simply used the exact same shots over and over and over and over again… “that’s like Michael Bay lazy.” Then they reuse the exact same shots for other Disney films… Baloo becomes Little John in Robin Hood being the obvious one; but seeing the others really taints a lot of the fascination you might have with Disney. But, it’s a Disney animated classic… so stay for the great songs like… oh forget it, you only know one and that’s why you’re here. I’m gonna be pissed when “Bare Necessities” isn’t played in the live action one. Starring: Jumowgli, The Big Balooski, Black Panther, Tiger Scar, and the Exact Same Voice as Winnie the Pooh (the creepy hypno-snake)… new title: The Jungle Bore. Bailey brings up Tailspin at the end and I’m immediately back in elementary school watching the Disney Afternoon with Tailspin, Darkwing Duck, and Chip & Dale’s Rescue Rangers… damn my cartoons were so much better than my kids’ cartoons! Screen Junkies has over 5.3 million subscribers on YouTube and releases a new Honest Trailer every Tuesday. The new live action Jungle Book debuts in theaters this Friday in IMAX and 3D.